I an designing a custom longsword to be built by Rob Miller at Castle Keep. I love the look of pattern welded steel, but I'm aware that what we have today is not equal to the Damanscus steel it resembles. I am curious if pattern welded steel sacrifices strength for aestetic. I want to order a functional sword, not just a good looking one. 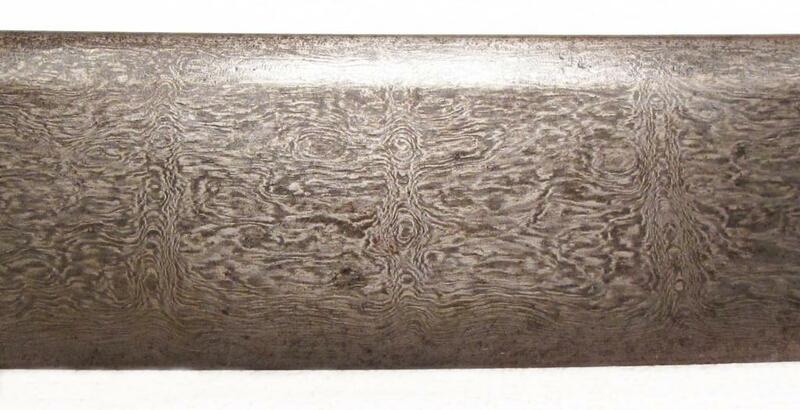 Pattern-welded steel is not a modern imitation of the original damascus or wootz steel. It's a different process that has been used since ancient Rome and involves fusing/forge-welding sheets of alternating steel together to create a "sandwich", which is then forged out, cut in half and restacked, etc to increase the layer count. This billet can then be manipulated by twisting, stock removal, and cutting and re-welding the bar in various ways to produce a pattern. "Damascus" steel is a crucible steel originating in India which was high-quality steel for its time but not superior to modern steel alloys. It also has an interesting pattern in the steel when etched, though to my knowledge this is not a result of manipulation by a smith. Pattern-welded steel is not appreciably weaker than a monosteel billet under normal use, provided it's made and heat-treated properly. It's a matter of trusting your maker, and as Rob Miller has been in business for quite awhile and has a good reputation I'd guess that you'll receive a product you're happy with. Good luck! ^Isn't pattern welded stell harder to heat treat proper because in traditional pattern welding you dealing several different carbon content and slag content in one blade? Pattern welded blades began as a way to refine and improve the steel used for tools and weapons. It bacame an art form of it's own. It is older than crucible wootz, so it is NOT a way to copy the eastern blades. It is possible to get harder and softer layers in a blade, but that is not advisable. A well made pattern welded blade should act like a single piece of steel and break like one. A blade made with alloys that do not heat treat the same, can often be weaker, and can delaminate along a break, or cause a break because of internal stresses. here are a few examples, a 1080/15n20 blade or O1/L6 blade would make good strong swords, as in both cases the temperatures required for austinizing, quench speeds, and tempering heats are similar, with enough overlap for both alloys to work well together. if you were to use say, 1080 and A2, you might tear the blade apart just heat treating it. The A2 requires more heat to austinize, so either the 1080 will have terrible grain growth, or if you use the lower heat, the A2 might not austinize. and then there is the quench, the 1080 requires oil, and the A2 is air hardening. Not a good mix. It might be able to be done, but I would not recommend it. Sorry if it was a bit long. Best of luck. One possible concern over pattern welded material is the welds themselves. If done well and cleanly, the welds are essentially equal to parent materials which have fused together. The more reputable makers will select the materials so that they do not suffer from dissimilar shrinkage during heat treatment. I would not worry about the strength if your source has a good reputation for producing pattern welded projects. The bigger issue for me is that you will need to maintain it (clean and lightly oiled after handling) to retain the visible contrast of the layers. In case of neglect, you might have to re-etch it. A local blacksmith or knife maker can most likely help you with that. One possible concern over pattern welded material is the welds themselves. If done well and cleanly, the welds are essentially equal to parent materials which have fused together. ... which is why some people warn against cheap pattern-welded swords, due to the possibility of poor welds. On the other hand, poor welds can be good: they are likely to stop cracks from spreading. Crack meets poor weld, and stops. Crack meets perfect weld and keeps on going. Of course, the poor welds themselves are a weakness, but most of the welds run along the length of the blade, where the impact of flaws is minimal. Poor welds (as long as they're not too poor) strength the sword across the blade, where you need a lot of strength, and weaken it along the blade, where it will still easily be strong enough. In summary, poor welds don't mean a sword is non-functional, dangerously weak, etc. The other issue is historical accuracy. I've never heard of an original pattern-welded European long sword. Correct me if I'm wrong, but so far as I know, pattern welding was long gone in Europe before the earliest longswords, greatswords etc. appeared. So to my eyes, a pattern welded long sword might look nice, but it screams out 'modern affectation'. I appreciate the information folks. Of course I should have known not to compare a pattern welded sword with one made of Damascus steel - I realize of course that we're talking about two completely different traditions and methods of swordmaking here. J.D. - good point about historical accuracy. I am working on a design for a custom longsword, and while I don't mind a small amount of "modern affectation", I would be remiss to commission a sword with too many historical implausibilities. This is all disregarding the cost, which will likely drive my bank account into open revolt. Perhaps a regular high carbon steel blade is the way to go. So either you get billets by some very experienced smith that operates in a consolidated way with a very professional heat treating firm (there are some who can advise smiths with sound infoe on materials choice) or you might end up with a pleasantly looking but sub standard product. "Damascus" steel is a crucible steel originating in India which was high-quality steel for its time but not superior to modern steel alloys. It also has an interesting pattern in the steel when etched, though to my knowledge this is not a result of manipulation by a smith. Addison, you are right about "damascus / wootz steel being completely different than pattern welded steel but there are certain damascus patterns that were actually created by physical manipulation of the steel billet during forging, "Kirk narduban" (prophet's ladder) is one well known example were the damascus billet was filed, chiseled etc before forging in order to create a reproducible pattern. It is possible to get harder and softer layers in a blade, but that is not advisable. A well made pattern welded blade should act like a single piece of steel and break like one. A blade made with alloys that do not heat treat the same, can often be weaker, and can delaminate along a break, or cause a break because of internal stresses. This is if we are considering modern best-practice heat treatment. For pre-modern heat treatment, pattern-welding (and simple lamination) can make it easier to heat treat. Welded-edge and sanmei, whether simple lamination or with a decoratively pattern welded body/sides can really benefit from dissimilar steels with dissimilar response to heat treatment. In particular, if you don't get the tempering right as can happen easily enough if you auto-temper (or don't temper, just quench), low-carbon alloys will leave you with a blade that won't completely break.